Where can I find the door chime on a 97 Blazer LT ? The previous owner must've disabled it to get rid of the annoyance, but I want to reactivate it at least for the lights. 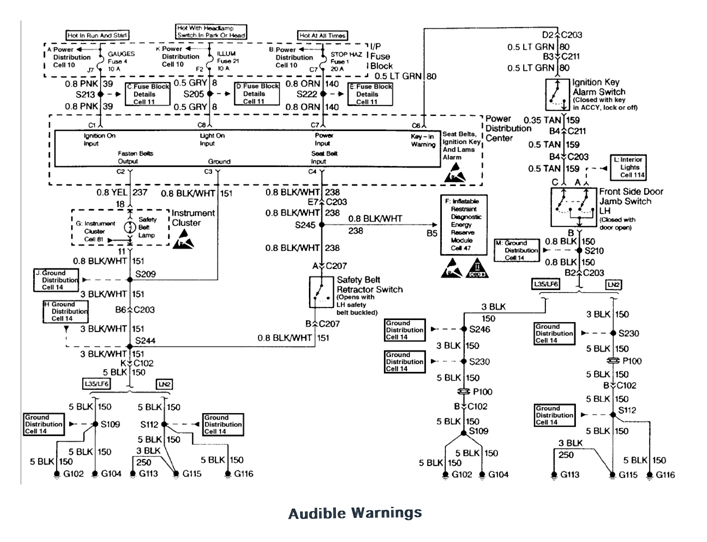 Here is the schematic for the audible warnings. Thanks for the schematics ! But where's the chime module physically located ? I got this from Alldata. At the end it talks about where the seat belt buzzer is. Probably all the chimes come from there. Hope this helps. I could not find any images for reference. With the Ignition Switch in START or RUN, voltage is supplied to the Seat Belt & Ignition Key & Lamps Alarm through the GAUGES Fuse 4 and the PNK (39) wire. When the Ignition Switch is first turned to START or RUN. voltage from the Seat Belt & Ignition Key & Lamps Alarm is supplied to the Fasten Safety Belt Indicator in the Instrument Cluster through the YEL (237) wire. The indicator stays lit for about 5 seconds. If the driver's safety belt is not buckled, a ground is applied to the Seat Belt & Ignition Key & Lamps Alarm through the BLK/WHT (238) wire from the Safety Belt Retractor Switch. The chime or buzzer will sound for about five seconds. Voltage is supplied at all times to the Seat Belt & Ignition Key & Lamps Alarm through the STOP HAZ Fuse 1 and the ORN (140) wire. With the key in the Ignition Switch and the Ignition Switch in ACC, Lock, or Off, the chime or buzzer will sound if the left door is open. With the door open, the LH Front Side Door Jamb Switch closes to ground. This provides a ground to the Seat Belt & Ignition Key & Lamps Alarm through the TAN (159) wire, the Ignition Key Alarm Switch, and the LT GRN (80) wire. The chime or buzzer will sound as long as the door is open and the key is in the Ignition Switch. When the Light Switch is in Head or Park, and the Panel Dimmer Switch is not at the dimmest setting, voltage is supplied through the ILLUM Fuse 21 to the Seat Belt & Ignition Key & Lamps Alarm through the GRY (8) wire. With the Panel Dimmer Switch at its dimmest setting, the current to the Seat Belt & Ignition Key & Lamps Alarm may not be enough to be sensed by the module. When the Ignition Switch is turned to RUN or START, voltage is supplied through GAUGES Fuse 4 to the alarm module through the PNK (39) wire. These two voltages are sensed and the alarm is not sounded. When the Ignition Switch is turned to Lock, Off, or ACC, GAUGES Fuse 4 loses voltage. The Seat Belt & Ignition Key & Lamps Alarm senses the change. If voltage is still available from ILLUM Fuse 21, voltage from STOP HAZ Fuse 1 is supplied to sound the alarm through the ORN (140) wire. The alarm can be turned off by turning the Headlamp Switch off. The alarm module no longer senses voltage from the Headlamp Switch, so the alarm does not sound. The seat belt alarm assembly is located in the power distribution block. The power distribution block is located under the instrument panel, on the right side of the steering column. 1. Seat belt alarm from the power distribution block. 1. New seat belt alarm assembly to the power distribution block. o Check alarm assembly for proper operation.